For every screening with live orchestra of Sergei Eisenstein’s Alexander Nevsky (music by Prokofiev), there should be at least a dozen screenings with live orchestra of Paul Strand’s Redes (music by Silvestre Revueltas). 1.Revueltas’s score is as great an achievement as Prokofiev’s, yet remains virtually unknown. 2.Unlike Nevsky, which Prokofiev turned into a terrific cantata, Redes does not readily yield a concert work; it requires pictures to make sense. 3.Alexander Nevsky is a galvanizing cinematic experience. Redes is only a galvanizing cinematic experience when the music is live. The original soundtrack, recorded in haste, is execrable. All this comprises the rationale for PostClassical Ensemble’s latest in its series of Naxos DVDs featuring classic 1930s films with the soundtracks newly recorded. In fact, this same DVD is the world premiere recording of the complete Redes score. “Revueltas is one of those composers who for various accidental reasons — his disorderly life and premature death, the fact of his being Mexican – does not occupy the place that he should in a present-day musical culture that clings so tenaciously to the sclerotic. . . . His music, so powerful in itself, highlights the rich artistic crossroads of the thirties, the tensions between modernity and mass culture, between formal innovation and political activism. “PostClassical Ensemble’s . 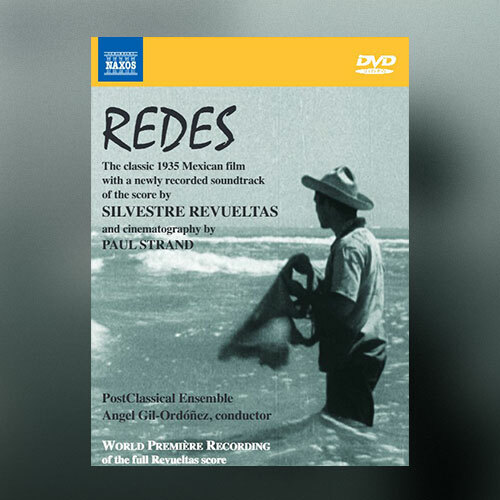 . . latest great effort of rediscovery is the premiere recording of the complete score composed by Silvestre Revueltas for a legendary 1935 Mexican film, Redes, in collaboration with the photographer Paul Strand and exiled Austrian filmmaker Fred Zinnemann. It is hard to imagine a more complete conjunction of talent. . . .
My English translation, abetted by google, does scant justice to this stellar example of what Americans call “arts journalism.” Especially pregnant is Munoz Molina’s observation of the “artistic crossroads of the thirties” – of the “tensions between modernity and mass culture, between formal innovation and political activism.” This perspective nails Revueltas’s high achievement. Prokofiev and Shostakovich excepted, has any other 1930s political composer – think of Hanns Eisler or Marc Blitzstein — so succeeded at mating originality, innovation, and popular appeal? I couldn’t agree more! The film and live music together are absolutely stunning, as I learned when Gisele Ben-Dor offered it with the Santa Barbara Symphony at a weeklong Revueltas festival for his centennial in 2000. I knew almost none of his music before that, but learned almost all of it while working on the program notes, and then had the pleasure of seeing Redes with live orchestra along with 2 others films and week’s worth of orchertral and chamber music. I’m very glad to learn about the Naxos CD with a modern sound track of this wonderful score.